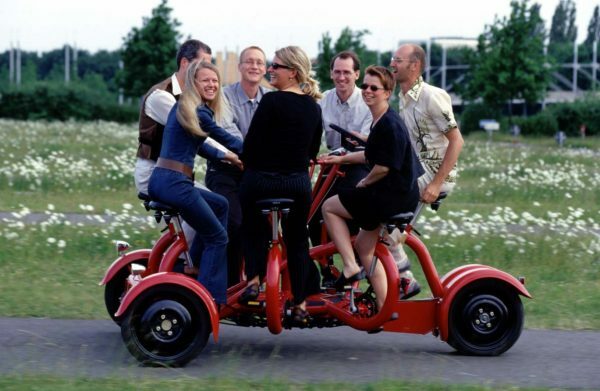 A circular, 7-person bike? You’re joking! It’s no joke: the ConferenceBike is a revolutionary way to bring people together. The CoBi-7 is pedaled by 7 riders sitting in a circle. One person steers while the other 6 pedal (or not) as the bike moves effortlessly along. More than 300 CoBies are now being enjoyed by a wide variety of groups in 18 countries. 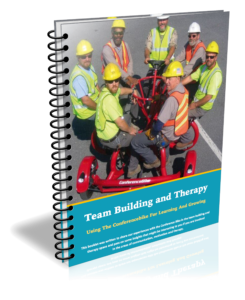 It is a tour bike in Berlin, Baltimore and San Francisco; a tool for corporate team-building in Copenhagen and San Diego, a way for blind people to bike in Dublin and Florida. 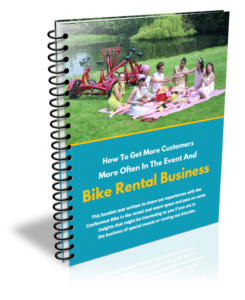 They have been used for fund-raising events and by biking advocacy groups worldwide. CoBies are being used to transport employees on the Google campus in California; and as ice-breakers at Vincennes, Stony Brook and Alfred Universities. Every group you can think of can use a ‘CoBi’ as a TOOL and a SYMBOL for bringing people together. Originally conceived as an artwork by internationally recognized artist/inventor Eric Staller, the CoBi makes every owner/operator FEEL like an artist; behind the wheel of this bike you SEE the joy that YOU are bringing to people.